It’s not very often that a piece of software comes along that makes me change my photographic workflow. If I remember correctly, the last time this really happened was back at the end of 2007 when I tried Adobe Lightroom 1 for the first time and within an hour of playing with the trial I purchased it. At that time I said to myself why had I waited so long to try the software. Well this has happened to me again! I had heard about Camera Bits Photo Mechanic software for a long time (in fact I downloaded a trial version in November 2012 but never installed it) so it wasn’t really new to me. I knew that sports photographers relied on it heavily and I had an idea that it was great for sorting pictures and adding metadata to photos. I really thought, why do I need this? A little while ago I was catching up on some photography podcasts and in particular this episode of Photography Tips and Trips from KelbyOne. Starting at about the 15 minute mark, RC Conception basically went through a very quick rundown of Photo Mechanic as well as giving tips on how to set up a Wacom Intuos tablet to help with one click sorting. I was intrigued and the next day downloaded the trial version of Photo Mechanic and set up my tablet the almost the same way. I had a card I had to move the images from onto my computer. Instead of doing a Lightroom import like I usually would have done, I used the ingest feature from Photo Mechanic to put the images in the folder tree that I normally would have with Lightroom. Next I opened the folder with Photo Mechanic as a contact sheet and started to rate the images in there using my tablet. The card contained all Canon Raw files so after I went through everything, I opened the Lightroom catalogue (I use several) I was going to import the photos to, imported the photos (in place import), then went to check my ratings… They weren’t there! I dug around a little further saw that I got caught by a simple little thing from the Photo Mechanic help files. I set Photo Mechanic up to write Raw ratings to XMP sidecar files (preferences, under files tab, always update XMP when changing color ratings) then I had to go into Lightroom and check the Automatically write changes to XMP (Windows > Edit Menu > Catalogue Settings, Metadata tab). Which is a setting that I believe should be turned on by default in Lightroom. This has both programs write the settings and the ratings to a small xmp sidecar file for each photo and allows for the two programs (as well as others) to work together. It is something that is turned on in most of my catalogues, I just forgot to do it with this one. I turned this on in Lightroom, synchronized the folder (metadata changes) and my ratings were there. I chose not to use the color scheme for selecting that is the default for Photo Mechanic because I used the star ratings (1 to 5) more in Lightroom. I buttons to rate stars and added controls for back and next on my Intuos Medium tablet. I did a few more folders that I had already imported into Lightroom and I was very impressed with how fast Photo Mechanic was at displaying the files. I love using Lightroom but when I am going through files for selections it has always driven me a little crazy with waiting for the standard previews to load when switching images. It is not all that slow, but waiting 2 to 5 seconds for the full display when switching between images especially with large files was a little of a slow down to my workflow. I used the trial version for a few days and was sold on it for sorting my files. I purchased the full version when Camera Bits put it on sale for 20% off a a few days later. I know that Photo Mechanic can do a lot more than what I am currently using it for. Not only can it keyword and change metadata on your images but it can be used to rename files and do more. A feature that I had heard about is called code replacement and is used by sports photographers. It allows you to type a small code For example a team color and number, b10 (blue 10), and have the software replace all instances of that in captions and other XMP data with a name that is a text file. I found a good tutorial here which also has 2 links to sites at the bottom of the article for other sites where you can get team rosters automatically for several pro teams and leagues. I have been using Photo Mechanic to tag all of my pictures for the last couple of weeks but not all was well. Earlier today I ran into an issue where although I was hitting the button it wouldn’t tag the files but would advance to the next image. I little trip to their support forums indicated that this was a problem for some people and reverting to an older build seemed to fix it. It looks like they are aware of the problem and from the responses it also looks like it is a Windows 7 problem that has surfaced in the last two weeks and only with Raw files. I have also found that I had to change the way I was rating photos with Photo Mechanic over the last day. I have purchased a 1 year account with the online Lightroom backup company called Mosaic. I will be doing a review of this service soon, but to keep things short, they don’t offer a lot of control of how your images get backed up and star rating is one of them. Marking everything that I wanted to further look at as 4 or 5 stars in Lightroom would have those files backed up to the cloud, which I am not ready to do just yet and may not have enough space with Mosaic. I switched to the default color tagging scheme (setting #2 winner alt) as my top color tag. I then had to change the labels in Lightroom for color flags to match. I saved this as a different Metadata Color Label set. Now when I have images that I have tagged and selected in Photo Mechanic they won’t automatically be backed up to the cloud via Mosaic until I am ready to have them done. When I am ready to work with images I switch the default color set for Lightroom color labels to my Photo Mechanic set and use the 4 colors I created for sorting. I left one color the same in both color sets in Lightroom so I can tag images purple and they show up using either color label set. Doing this is just a way of me being able to select a group of images and then change them to the Lightroom default color set if I wish. So as of now my workflow is as follows. When I insert a card in my reader, Photo Mechanic starts up the ingest window and I point the images to the folder I want to place the photos in. I also add my additional copyright metadata at this stage. I then open the folder as a contact sheet in Photo Mechanic and sort the images into 3 levels of color and a trash color. I select only the trashed images and at this point I delete them. I then open Lightroom and export the images into the catalogue I want to use. Changing the metadata color labels set, I can sort the select the pictures in Lightroom and apply a star rating or set them as purple so that I can change the label to one of the Lightroom default colors. 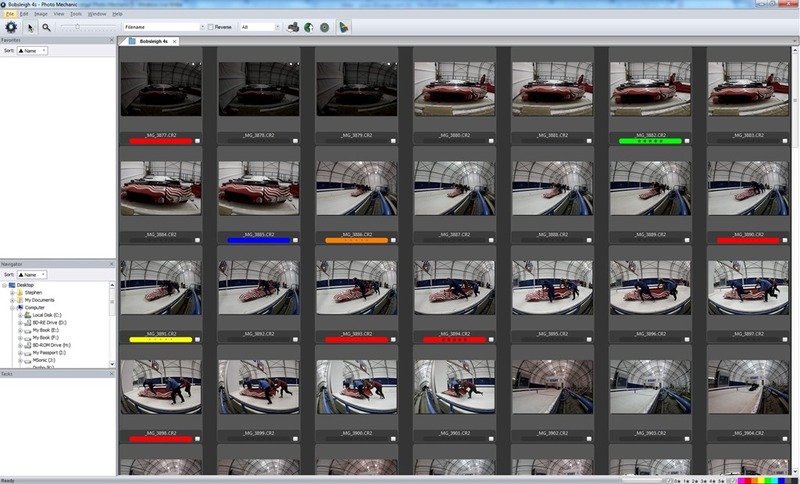 So far this workflow has been great for me and has sped up the sorting and picking of my top images. I am even starting to use it to go back to folders I have already imported into Lightroom and redone the sorts there only because I do find it faster to do. As I said earlier, I know that so far I am only using a fraction of what Photo Mechanic can do. I will continue to play around with it and read the manual and start putting more and more of this software’s power and features to use in my workflow. It is not the program for everyone though! Unless you are shooting and having to sort lots of images while you would benefit from the software you likely won’t need it. It is a little on the expensive side at 149.00 USD and unless you need the time savings to sort the images you should be just fine with Lightroom. I shoot a lot of HDR 360 Panoramas both for business and pleasure and can end up with 20 frames per node and even more if I have reshot a “turn”. Using Photo Mechanic allows me to weed out the bad exposures prior to bring them into Lightroom. I also shoot a lot of bracketed HDR shots as well as doing a fair bit of sports photography so it is really worth my while and my cash to use something like this. I can see wedding and portrait photographers also benefitting from the tagging ability of Photo Mechanic. Die hard Photoshop users that don’t have Lightroom may also want to use this to sort, select and then edit images in ACR (Adobe Camera Raw) or Photoshop. This entry was posted in Products, Reviews, Tips, What's New and tagged Edit, Images, Lightroom, Metadata, Photo Mechanic, Photos, rating, selecting star, Software, sorting. Bookmark the permalink. Thanks for the comment Bob! So like I said, I ingest from my memory card to my system. Make selections with flags and colors and apply my basic metadata. Once the images are ready I go into Lightroom and do an import. Yes Lightroom does pick up all of the changes because Photo Mechanic writes to xmp files and I have Lightroom set-up to also create xmp files. IF I use Photo Mechanic to make changes to a folder of images that I have already imported into Lightroom, once I am done I go into Lightroom, right click on the folder and scan for changes. Once done this will pick up any changes from photo mechanic. If I am renaming files I usually do that before I import into Lightroom in PM or I do it on export using Lightroom. THe Lightroom catalogue does not automatically track changes though. But if you remember to sync the folder it will be picked up. You will see a warning on the files in Lightroom that the metadata has changed and do you want to pick it up from the disk. Thank you so much for this article! The question that BobS asked was exactly what I needed to know, and this was so helpful!